Riya and Abby are best friends, but their dynamic changes when Riya moves to Berlin with her family and Abby stays behind in California. When miscommunication threatens their friendship, Riya proposes an epic adventure that involves two weeks of gallivanting around Europe to see the sights and spend time together. But will their trip mend their friendship or will it all fall apart once they each discover that the other has been keeping secrets? Plot? 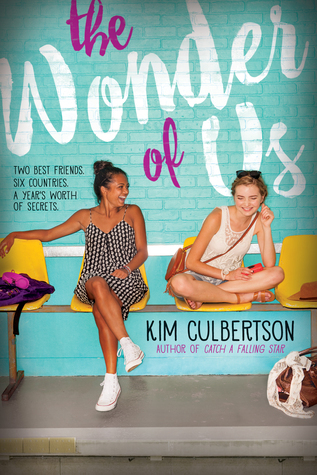 Culbertson has a written a story that is about two very different girls who, if circumstance had deemed it differently, might never have been friends in the first place. Their current life situations have put their relationship at a crossroads, at a point where there are growing pains for both girls. It's really interesting to see how Culbertson chooses to show how each girl has really become someone else after their own individual settings have influenced them, and I liked how she explored the resulting tension in their dynamic with one another. Additionally, it's also really fun that she chose to use a few European cities as a backdrop for this exploration of friendship. Characters? There is a large cast of supporting characters in this novel, but I wanted to focus on our two main girls. Riya has always craved something more than their small California town, and living in Berlin with her family has given her a taste of that. I really liked that she was adventurous, optimistic and confident; I didn't like how she handled her secret from Abby at all. Abby, on the other hand, is a lot more like me as a person: introspective, and totally okay with being on her own or with the small group of people she likes. She's going through a rough, confusing time, so unlike Riya, she doesn't have it all together - which I could totally relate to. It was interesting to be able to read from both of their perspectives however, as it helped me see both sides of their relationship! Writing? It was really easy to read! I flew through the pages of this one. Even with the two different perspectives, I never got confused about who was narrating the section I was currently in. And I loved the way the sights and feel of the places were integrated in the little details that Culbertson managed to mention. Overall? I really like reading stories with complicated friendship dynamics, so that in itself is a major reason I ended up enjoying this book! I also thought that both Riya and Abby were complex, interesting characters, and getting both their perspectives was nice. Add the backdrop of a European adventure, and you've basically got a book that is totally made for me. While it's not a new favorite, mind you, it was still enjoyable and would be a great beach read!